Sometimes I feel I am the right parent at the wrong age or maybe the wrong parent at the right age. At least never the right parent at the right age. I am so archaic in comparison to the new age hip parents that sometimes I feel I should have paid heed to the ever well wishing relatives, you know the ones who wanted me to get married young and have kids early and keep a fast every alternate Saturday. If I had my kids really really early, early as in right after ummm high school, I might have aimed for grand kids now and then I could at least be the cool grandma instead of the uncool Mom. Why did such wisdom dawn so late, you might ask. Well because it was only last week that I came to know of TogetherVille, a social networking site for kids under 10. I didn't even know the terms "social networking" and "kids under 10" can be uttered in the same breath.But apparently teeny-tiny kids need a social network and right after school these teeny-weeny kids need to jump onto the internet to connect to friends over the internet and discuss social life and maybe exchange vacation photos and show off Dad's new Mercedes. It is all very safe and protected and Moms/Dads who need to be on FB for their kids to be on Togetherville are raving about it. Me? I said, I am old. I think the best way for my kid to "social network" is hop across to a friend's place. Naturally, by just going out of the door and knocking on the neighbor's door if you have a neighbor like mine or premeditated, with some effort on the parent's part, by setting up a time&date for play with friends not exactly next door. But definitely NOT online. I think kids need to play with friends in real, they need to just go and get some un-organized play, not necessarily a sport, in a jumping-hopping-little pushing-running way. That is how they connect if needed after school, where I am guessing a lot of "social mingling" should get done. But why would a 6 or a 7 or a 8 year old need to connect to someone, anyone ONLINE ? For the life of me, I am unable to understand this whole Togetherville thing. How uncool of me. How deprived my kids are. And on top of this I make them eat Moroccan Carrot Soup. Yikes !!! And honestly I have nothing against Mark Zuckenburg or Mandeep Dhillon or Pope Benedict except admiration and a tad envy. I even think Zuckenburg is cute if anyone is hearing. 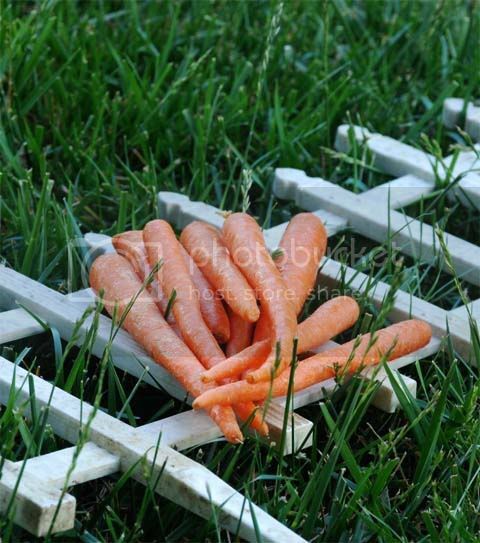 We have a big bunch of carrots at home, thanks to organic carrots becoming easily available in our price club. This time it was too much though, way too much carrots to anyone's liking. So, I decided to make a carrot soup and most sounded like bleah until I chanced upon this one. The "Moroccan" did it for me. I also added some Lentils, because I love them. I love lentils so much that if given a free reign I will put them in pretty much everything, even dessert. Ok not dessert because I love my dessert more dearly than the lentil. I also added Garam Masala and Green Chili and did everything to make it the most Indian Moroccan Carrot lentil Soup ever.Morocco are you listening, next time please can you include Garam masala and Green Chili and some Paanch Phoron in your cuisine ? Please, pretty please, I love your food. Add 2 cups of thick slices of carrot and saute till the carrots start browning a wee bit. Add about 3 tomatoes from a can of whole peeled tomatoes or use 2 medium fresh juicy tomatoes chopped. Saute the tomatoes till they are mushed up and there is no raw smell. 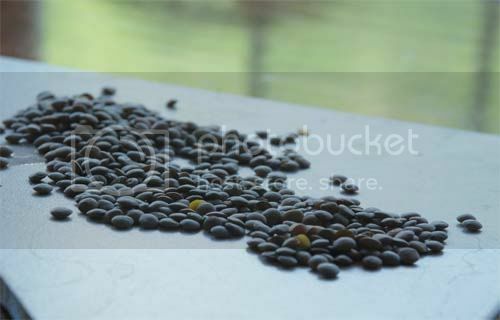 Wash and add 1 cup of brown lentils. Mix everything well together and add about 3-4 cups of water. Add about 1 tsp of Garam Masala Powder, salt to taste and cover and cook. 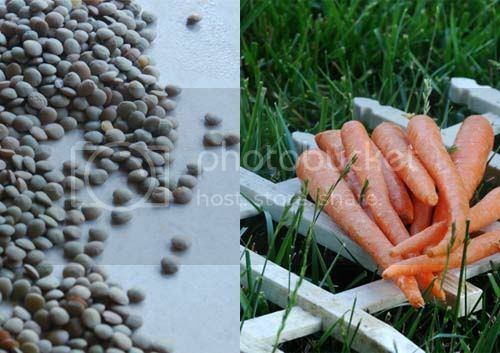 In 20-25 minutes the lentils and carrots should be done. Add 1 tsp of honey and mix well. Adjust for seasonings. 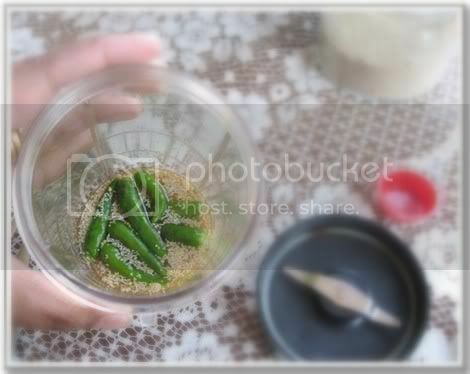 Cool and puree in a blender with 2 green chili. Ok, chili is optional. When you puree, save 1/4 of the soup sans the carrots in the pot. Put back the blended soup back in the pot and simmer at low heat. Dry roast 1 tsp of cumin in a skillet till fragrant and grind to a fine powder. Add this roasted cumin powder and 1 tsp of Paprika to the blended soup. You can add 1 tsp of Lime Juice if you want, I didn't. 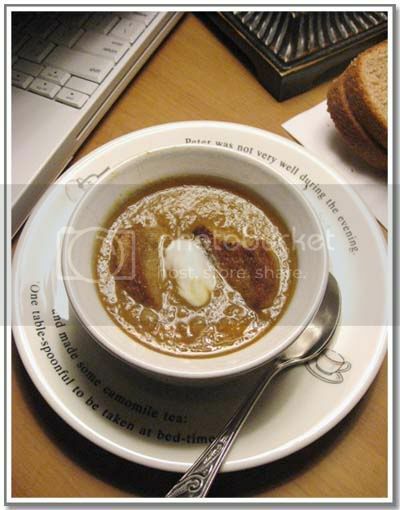 Ladle the soup in bowls and serve the soup with a dollop of yogurt. 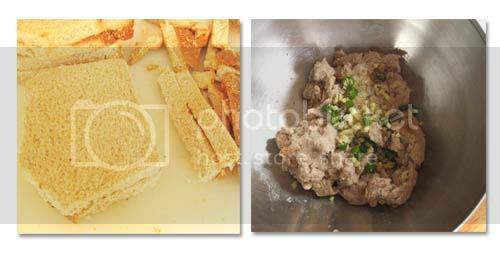 For a carby version, tear a slice of wheat bread and toss with olive oil, roughly chopped garlic, salt and pepper. Toast in the oven till crisp. Dunk in the soup. A large chunk of my growing up years have been spent in small town India. Small towns, small buildings, narrow roads, greener trees, wider skies and smiling people. This town I am talking about was so small that it did not even have an air-conditioned restaurant or a public movie hall. The township had a movie club and showed 4 showings of the same movie each week. Every family got two passes each week, 8 for the month and you went and saw whatever movie they played that week. By you, I mean only the adults, no one thought kids needed to watch movies and so there were no passes for the kids. Did we feel we were missing something ? No, nothing that I can think of. I remember seeing "Mr.Natwarlal" after the final exams, sharing a seat with a friend when my Mother lend me her pass after the exams and I don't think it was a movie worth remembering if not for the rarity of the situation. Though the town had no decent restaurant, it boasted of a very delicious sweet shop. The shop was nondescript with its thatched roof sitting limply on sturdy bamboo poles, rickety benches and tables where the flies made merry and grubby glass counters displaying the sweets. The owner and also the sweet maker aka pastry chef, however had a character. He was rotund, with white walrus seal mustache and sat stirring the milk down to khoa so happy and contented that he personified the sweet shop. And his products were to die for. If I close my eyes I can still imagine how good his lyangcha and cream chop was and it has been two decades since I have tasted them. Now this post is not about the movie hall nor the sweet shop. I digress. It is about the small town though, where neighbors dropped in without making an appointment a month early and my Ma happily entertained them without thinking her time was being wasted. 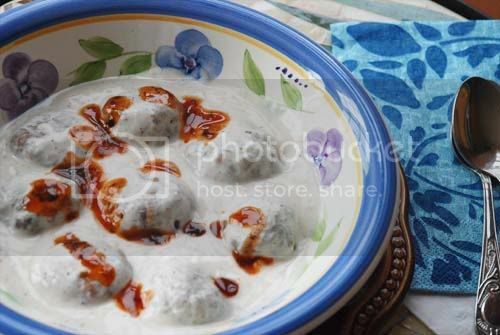 She enjoyed making a quick snack on such occasions and a very popular one was the Paurutir Dohi Vada or Bread Dahi Vada. Though my Ma insists that I use ONLY WHITE BREAD for this dish, and that is how it tastes best, I have stuck to my guns and used WHOLE WHEAT BREAD. If you have white bread, do use that as the vadas are crispier that way. Take 6 slices of bread and remove the crusty edges. Do not throw away the edges, you can make croutons out of them. Holding a bread slice in the palm of your hand, sprinkle water on it and then press between your palms squeezing out the water. The bread should become soft and pliable so that you can make a dough out of them but it should not be soggy and watery. 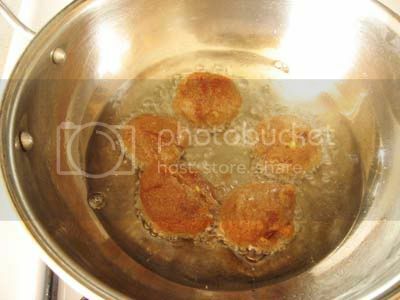 Deep fry them in oil till they are crisp and deep brown.Alternately fry them in the appe pan till they are brown and crisp on the outside. and whisk till everything is mixed. Tip: I did not do it but garnishing with a fistful of sev would be a good idea. 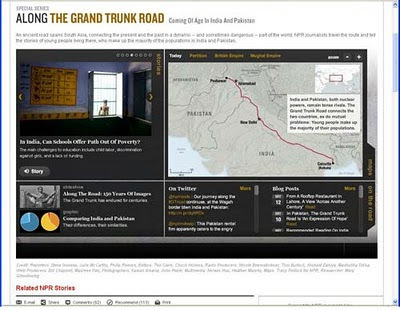 Has anyone been following "Along the Grand Trunk Road" on NPR ? It was last week that I heard first of the series when Philip Reeves started out on his journey from Calcutta and spent a good few hours searching for the start of the road, with a banter typical of Calcutta on the background. For a route of such enormous historical stature, the Grand Trunk Road makes a surprisingly modest start to its journey across the breadth of northern India, through Pakistan to the Hindu Kush. Maps suggest that the road sprouts out of the heart of India's great eastern city, Calcutta (also known as Kolkata), not far from the banks of the mighty Hooghly River, a distributary of the Ganges. But if you go there -- as NPR did, at the outset of our trip along this ancient highway -- the starting point is not particularly easy to find. Residents of Calcutta love nothing better than a good debate; the city's famous for its militant left-wing political activism. Stop in the street and ask local residents where the road begins, and they will happily launch into a lengthy argument on the subject. We were finally directed to a large banyan tree, beside a railway crossing, where a small throng of truck drivers were sitting in the shade, drinking tea out of clay cups, and playing cards. There was a consensus among the drivers that we had found the right place -- the spot where the Grand Trunk Road began during British colonial rule when Calcutta was the imperial capital. I couldn't follow the series on the air waves thereafter but I am reading it on their site. On May 14, NPR was at the city of Aligarh along the G.T Road and they threw a very pertinent question. In India, Can Schools offer a path out of Poverty ? Millions of Indians definitely think so and education is highly rated amongst the mass but the Government obviously thinks otherwise and very little thought is given to public education. India has some stellar educational institutions. The government-supported Indian Institutes of Technology churn out thousands of world-class engineers every year. The fields of medicine and business have similar elite colleges. Hundreds of thousands more young men and women graduate from colleges and universities just a rung or two below in terms of excellence. Yet as students toil in classrooms and coaching centers, desperate to get into these elite institutes, even larger numbers of Indian youths barely get a start. Last year, UNICEF estimated that about 8 million Indian children between the ages of 6 and 14 were not in school. Isn't that so true ? In a country where education holds such high esteem, it seems abstruse that literacy rate is so low . And even getting a primary education when you can modestly afford it, is not easy either. The other day someone in the family who lives in the technology hub in the southern part of India was discussing the lengths they had to go to get their two year old admitted to a reputed school. The reputed school is one of the few which do not demand huge sums of donation and so has a stringent entry policy. The two year old was interviewed by a posse of 4 teachers to be admitted into what but a 2 hours play class. I am sure my kids would be illiterate if they were in present day India.No way would I allow 2 year olds be asked questions on color, creed, alphabet or animals. Yeah, I might grill them on such things but not any stranger throwing such stuff at innocent minds, thank you. Follow the series here, I am sure there will be some very nice moments along the road. 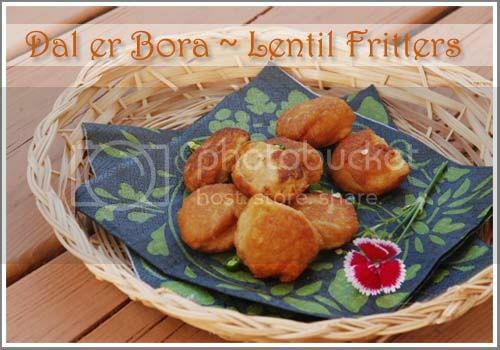 There is nothing great about Daler Bora or Lentil fritters. Every cuisine has its own version of it. Simple delights to tide you on rough days. What is different about today's dal bora is how I made them, using a strange contraption that looks like an instrument used by aliens in 6000BC and later excavated from Harappa. It was this, this and this and this that played a major role in me ordering this strange stuff for only $10 on the internet. Yeah, they sell such relics from the past on the internet and call it Dutch with a still stranger name, ebelskeiver pan. You would think there is a link between the Dravidians and the Dutch, yeah more similarity than the "D", for this same Ebelskeiver pan is popular in Southern India as the Appe pan or the Paniyaram Pan( a staple in the South Indian kitchen as my friend indosungod says). I had never ever heard or seen such a thing in all my life in India and so though I bought it in December, it sat uptight and conscious waiting to be of any service.. And then this gave me the push and since then I have been on a roll. 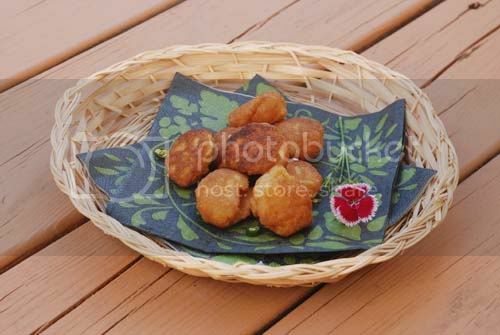 I have made pakodis and fritters and all kind of fried stuff that I would normally not make much. With this pan my oil usage was way less. 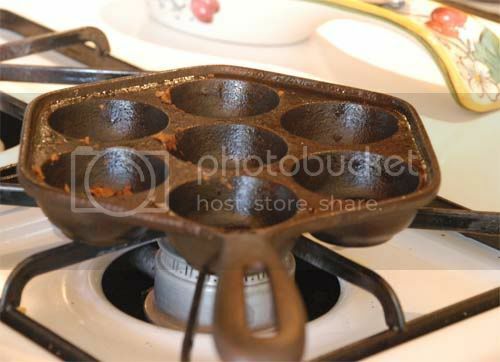 I did not have to heat a whole lot of oil for frying only to be thrown out after use. Also my pakodis/ boras/fritters were tiny and cute which meant we could eat more of them thinking we were doing portion control. 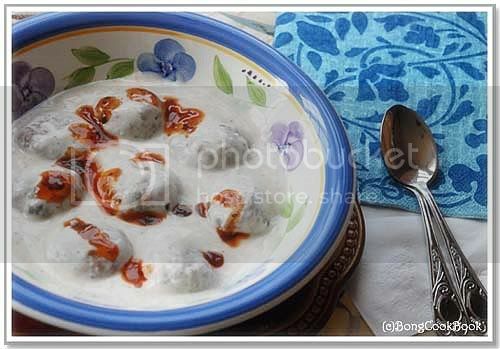 This time it was the very Bangali Dal er Bora made in the Southie Appe Pan, something like Mani Ratnam making a Tollywood(Bengal's Holywood) movie. 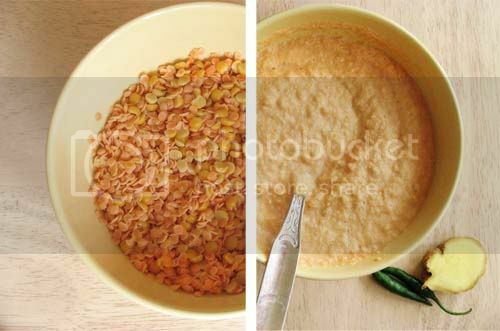 Soak 1/2 cup of Matar Dal(split peas) & 1/2 cup of red Masoor Dal in water for half an hour. 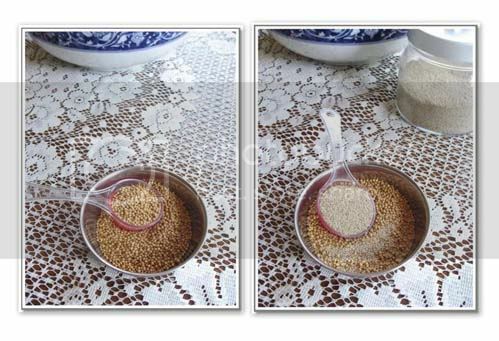 If you want only Musur Dal er bora, You can increase the masoor and decrease the Matar till Matar Dal becomes 0 cup. If you don't have matar dal use chana dal. Add salt to taste to this paste. If you wish add 1 tsp of roasted cumin powder . Since I was making niramish bora I did not add any onions. Ok to tell the truth I forgot and decided it was a niramish bora. But you can add 1/2 of an onion chopped fine. 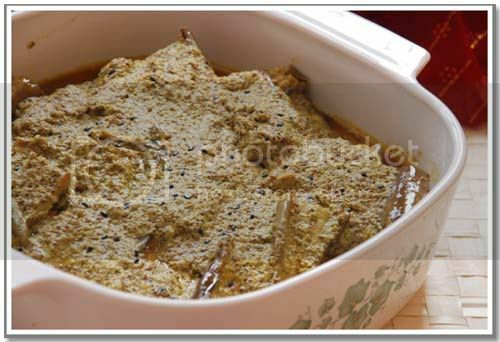 As a reader "khabarpagol" says in the comments, finely chopped corriander leaves and a few nigella seeds in the batter makes the bora tastier. So go ahead and add that. 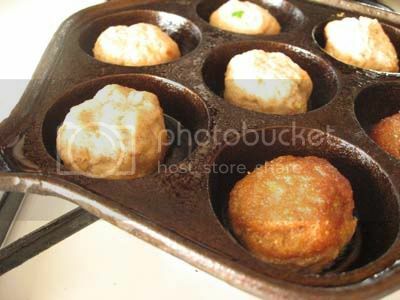 Now add oil to each of the round slots of the ebelskeiver pan and heat. Since my pan is cast iron, I add a little more oil(about 2tsp oil in each slot) for the first batch. For the next batch, I just add drops of oil along the edges. Add a spoonful of lentil paste in each of those dark crevices and see the oil merrily bubbling around. Keep the heat at low medium. 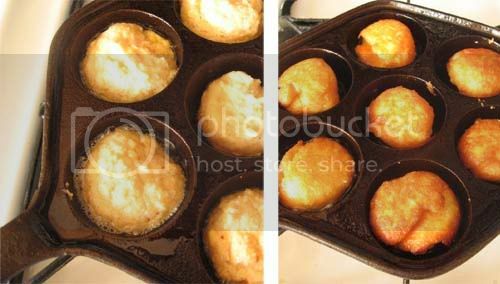 Once one side is golden brown with the help of a fork, a spoon or a skewer turn the other side and cook till both sides are brown and crisp. 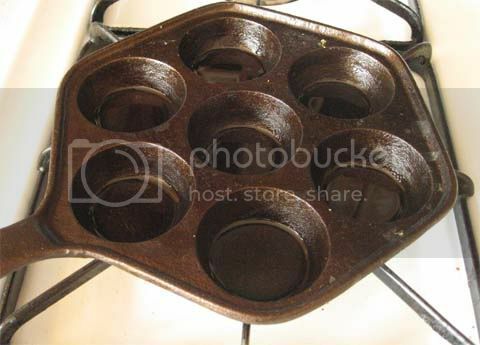 If you do not have this pan, don't fret, you can always fry this the regular way. 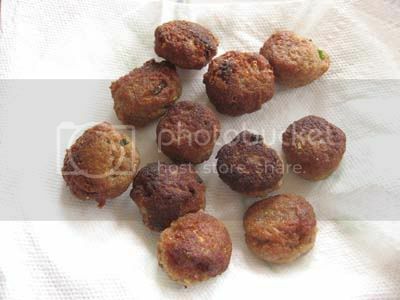 Tomorrow I will tell you what I did with these daler bora or fritters, other than eating them just like that of course. I have a dream, to cook in peace. That sounds so much like ABBA that I am changing that statement though that IS my dream. Ok, so I want to cook in peace, in absolute silence with only sounds of nature around me, and by sounds of nature I do not mean kids talking, fighting, babbling and saying "Mommy" every 3rd second. As much as I love these tiny mites, I do not believe that I need to run my cooking steps through them every time. I mean why does a toddler need to be carried so that she can see if I am doing tempering right. Even if she thinks I am doing something wrong and the meat is underdone, I am not going to listen to her, am I ? Who is the Boss around here, tell me. And why every time that I grind something, there are tiny hands clinging on to my legs and wailing "Mik chi Mik chi" to clamber up. Why is the "Mik chi" the sixth wonder of the baby world ? What is so wonderful about tiny circles of yellow mustard seeds and flecks of green chillies dancing around in a glass jar and going krrrrkat kat krrrr ? I mean it is a great invention and all, close to the heels of a particle accelerator and makes my life very simple but does a baby need to see it in motion every time and be mesmerized. What happened to cuddly elmo or even her sister's kid size juicer and blender ? Isn't that enough ? To avoid such intrusions during cooking, I put the vent fan on very high and then turn on my magic bullet blender, praying silently for it to do its job quietly. But the little ears where ever they are hear it and come running, trying to see what the "mik chi" is doing this time. And demand to be held up, to observe the physics behind that chaos and to imbibe some theory that I am incapable of observing. 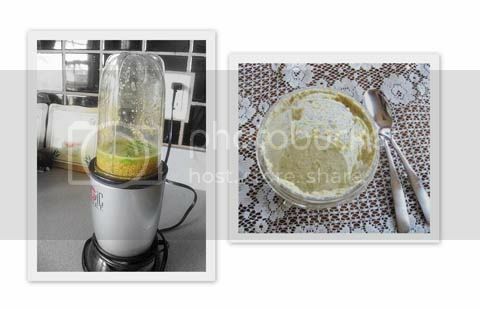 * Back home we called the blender or the food processor or any such contraption Mixie and I still tend to do that at home. Honestly I don't even know the difference between a Food processor and a blender. I have a Food Processor which has very bad work ethics and does not do my shorshe(mustard) or posto right while this blender does, that is all I know. After all that if I made a decent Shorshe Begun thank your stars. 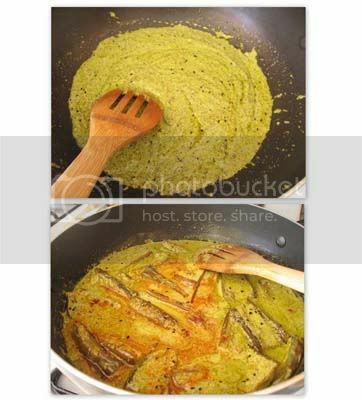 Bengalis tend to eat a lot of shorshe or mustard or sarson or sorisha or senape and will douse everything on earth in this mustard sauce. Eggplants thankfully do a very good job when they are doused with mustard and Begun Shorshe, Shorshe Begun or Eggplants in Mustard Sauce are an all time favorite. In this particular recipe I have used a friend's suggestion to add lots of fresh coriander while making the paste. Enough fresh green coriander to give the paste a pale greenish color which you will not see in any photo because my coriander was not fresh enough. 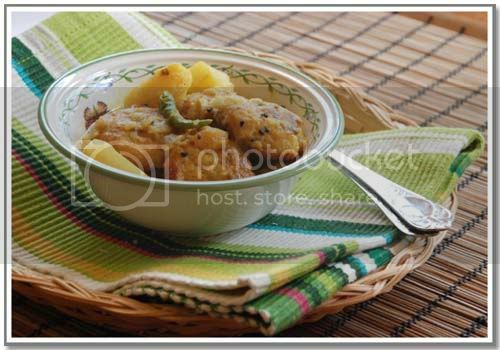 Did I say, it needs to be F--R--E--S--H.
That is an unusual thing for a Bangali shorshe bata, the coriander. 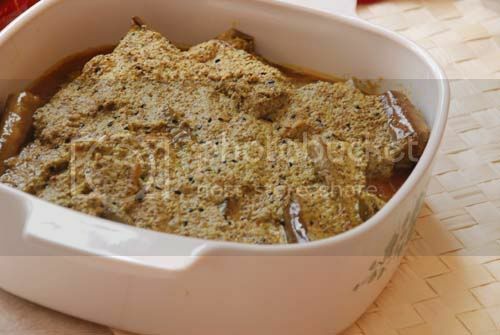 Bangali shorshe bata doe not have coriander, period. But this one does and that gives a nice flavor to the dish. 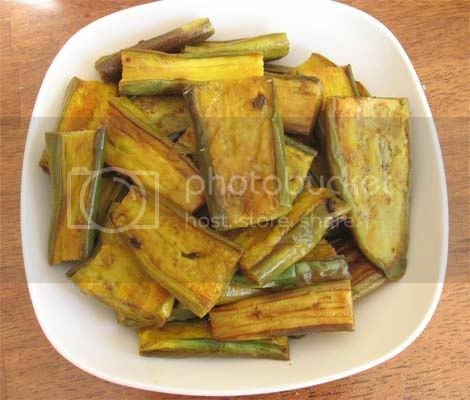 This dish also needs enough Mustard Oil, for the eggplant slices to be fried till they are dripping Mustardy goodness all over. If you are Mustard Oil averse and using Canola, do so, just don't come back and complain. Enjoy this dish mixed with white rice and eaten with bare nimble fingers and thank the "Mik chi". Chop Eggplant in longitudinal pieces. Smear with salt and turmeric and keep aside. I have used 2 large eggplants(or 4 of the slender long ones) for this recipe. Heat Mustard Oil to smoking. Fry the eggplant pieces to a light golden. Remove with a slotted spoon and keep aside. Heat some fresh Mustard Oil. 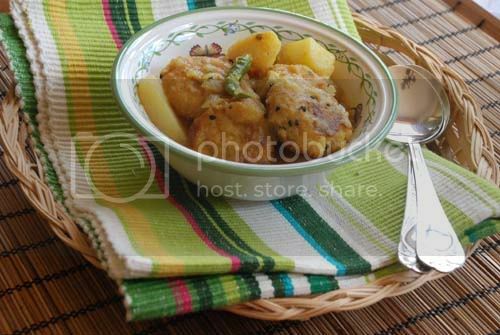 If you don't have Mustard Oil, use any other White Oil but Mustard Oil is best for this dish. Temper with 1/2 tsp of Kalonji/Nigella seeds. When the spices pop, add the the mustard paste. Saute for a minute or two. Add 1 cup of water, salt to taste and let the gravy come to a boil .Then let it simmer for some time till gravy is thick and mustardy. If you like it hot add 1 tsp of red chili powder at this point. The gravy should be enough for the eggplants so adjust water accordingly. When the gravy starts boiling, add the eggplant pieces to the gravy and switch off after a minute. Drizzle a little mustard oil on top, cover and let it sit for 30-40 minutes or more. Let it sit for some time to let the eggplant soak in the gravy. Serve with white rice. I am sure by now everyone worth his or her salt of blogging is aware of Aqua's event Of Chalks and Chopsticks. She started it with a great vision, yeah there are visionary people out there if you didn't know, and a lot of bloggers believed in her, in themselves, in kayanat (as SRK would say) and wrote beautiful stories around their food. If you don't believe me and think I am just spinning yarns go check. After your verification and validation, come back and read the post. I am waiting, come on. Now that you have read the tales and lore in the First Edition, get ready, tap your brain, day dream, lose your job while doing it and write your very own Food Fiction for "Of Chalks and Chopsticks -- 2nd Edition". Yes, there is a 2nd Edition. And don't you roll your eyes, what is wrong with a 2nd Edition ? So please, pretty please, write a food fiction, a story around the food you cook, and eat and serve. Even if you don't like cooking, wonly eating is your motto of life, there should be a story around that food, write that while you eat, and send it to me. Usually writers and creative people are ummm very creative and do not like to be restrained or curbed or told to walk on the pavement and not bang on the middle of the road. 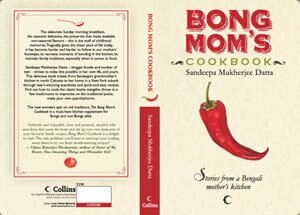 So I am not sure if you would like the idea of a theme to framework your food fiction on. But Sunday being Mothers Day and all, I thought what if your fiction has to do with Mothers, not necessarily yours, it is fiction so any Mother would do, any Mother who is human and has offsprings and has dealt with human poop and joy would do, a female one would be better. But this is not necessary, just a suggestion.Your fiction can be anything as long as there is food going with it. 2. The story you write has to be related to the food you will cook or eat or discuss in that post. Eagerly looking forward to your entries for "Of Chalks and Chopsticks" brainchild of Aqua, co hosted by Sra and me and written by all of you. Yippeee!!! The winner of the giveaway has been decided by Random.org. It is SS @ SS Blogs here. I don't know why she says here, I mean shouldn't it be there. She doesn't blog here, but there. You get it there as in there at SS Blogs here. Yeah go visit her and tell her that she has won and give her your best wishes so that she can run as much as she likes. Congratulations SS and you will be receiving your $80 gift certificate from CSN Stores soon. Thanks to everyone who participated and played along. Thanks also for all your valuable inputs. Though I must warn you, this blog is ruled by a meanie autocrat who does not abide by the principles of democracy. So she might just dish out what ever is cooking in her kitchen and her family is eating without a thought for the options chosen by readers. And all those who said "keep doing what you are doing" or something like that, do you guys know me, like in real life ? Like do you know that I am not a sucker for change and I do things my way and that my toe nail needs to be trimmed ? How the heck did you know that I will just do that, i.e. "keep doing, what I am doing".